Six seasons - each with its own character. The first vegetables of spring are all about tenderness and new growth. We've been eating sturdy winter fare for so long that slender, tender, and delicate is exactly what we need ...a ripe juicy tomato would feel too much, too soon. Early summer steps up that game a bit - the flavours aren't yet intense, but the fresh and green notes are deeper and all is livelier. Midsummer starts the flavour riot - more variety, more colours and textures. Late summer is the lush period - the richest colours, most vibrant flavours, and sensuality. Then back to fall and winter, when life in the fields slows down. In each of the six seasons, McFadden celebrates vegetables as only a chef with the soul and experience of a farmer can. Vegetables appear not only in their prime seasons but also in multiple seasons, because how you handle, say, a young spring carrot bears no relationship to what you do to storage carrots in winter. McFadden's intuitive feel for the way seasons affect flavour translates into recipes that coax out the best of each ingredient. The 225 fresh, modern, and entirely approachable recipes range from the raw to the cooked to the preserved. While 75 percent of the recipes are vegetarian, there are plenty in which meat, seafood, and poultry play a supporting role. All have that great vibrancy made possible by McFadden's keen sense with seasoning, and his ability to get to deep and rich without the use of unnecessary fats. These are but a few of the many lessons taught in this beautifully photographed book. "A great book. Period. . . . Never before have I seen so many fascinating, delicious, easy recipes in one book. . . . In fact, it's about as close to a perfect cookbook as I have seen. What McFadden and Holmberg have achieved is no small feat: This is a book that will educate nearly everyone who picks it up, a book beginner and seasoned cooks alike will reach for repeatedly. It's the rare book that achieves what it sets out to do, and manages to do so in a manner that is both appetizing and engaging. It is accessible without sacrificing its artistry." "The book's appealingly simple recipes are focused on delivering big flavor." "Six Seasons: A New Way with Vegetables is poised to join the veggie canon. . . . The flavors are big. . . . They're also layered and complex, despite their apparent simplicity. What will really change your cooking is [McFadden's] approach to seasoning. . . . Trust me: Read this book and you'll never look at cabbage the same way again." "Achieves the near-impossible: Recipe after recipe of restaurant-quality food that isn't difficult to put together." "Stellar mix-and-match recipes that highlight produce at its gorgeous peak." "The Six Seasons cookbook. Have you bought it yet? I know this is awfully bossy of me, but I think you should. I think that if you, like me, delight in inventive but not overly complicated vegetable preparations (225 of them, even), things you hadn't thought of but that you'll immediately tuck into your repertoire, you're going to love this book as much as I do. I confess I've had it for almost a year. In that year, I've been almost overwhelmed with how much I've wanted to cook from it." "Exciting flavor combinations mean this is no mere guide to vegetables but a primer on how to make them taste their exciting best." "Downright thrilling. . . . Divided into six seasons rather than the traditional four--a more accurate reflection of what's happening in the fields--the book encourages readers to embrace what he calls 'the joyful ride of eating with the seasons. . . .' On page after page, McFadden presents a deliciously enlightening way of cooking with vegetables." "Enduringly rewarding. I am utterly consumed with Six Seasons and feel I could cook from it every day without tiring." "This cookbook might put meat out of business. It's that good. . . . A rare source of new ideas about vegetables. McFadden's forward-looking sensibility infuses every recipe." "[This is] a cookbook I've gotten a little obsessed with. . . . The book offers inspiring treatments for vegetables that are often relegated to a boring crudit tray--if you're looking for a new way to treat celery or cabbage, you need a copy." "Six Seasons is a beautiful book. But it's more than a pretty face: It's a practical primer that begs to come into the kitchen--and won't disappoint once you get it there." "An exuberant, engaging approach to vegetables. . . . Six Seasons is a joy. . . . [It] manages to feel comprehensive without sacrificing delight and humor." "The most exciting approach to home cooking I've seen all year. . . . Six Seasons is one of the most satisfying cookbooks I've purchased in years, and McFadden's insights into seasoning are invaluable, even for an experienced home cook." "A must-have cookbook that stands out from the crowd of vegetable-centric cookbooks. . . . This cookbook deserves to become a well-thumbed, vital addition to any kitchen." "Essential techniques that can help cooks become better at preparing seasonal and local vegetables. . . . Attractive vegetable recipes range from brightly colored raw and cooked salads to indulgent appetizers, pastas, and baked goods. Under McFadden's tutelage, cooks will learn how to bring out the best in every humble vegetable." "McFadden's debut cookbook is an invaluable resource for all things veggie." "Visionary. . . . Beautifully produced." "This is not a cookbook for coffee tables or artfully curated bookshelves! Its recipes demand to be tasted until the pages are dog-eared and sauce-splattered and stick together. Compulsory for the home cook." 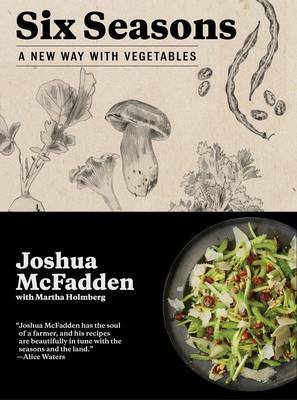 "Joshua McFadden has the soul of a farmer, and his recipes are beautifully in tune with the seasons and the land." "Joshua [understands] vegetables from the perspective of both a farmer and chef. His mouthwatering and terrific solutions . . . get the most out of vegetables from their beginning to their last act on our plates." "We always knew Joshua was a vegetable magician, but this is so much more. We learned something new on every page. Six Seasons is a brilliant cookbook."